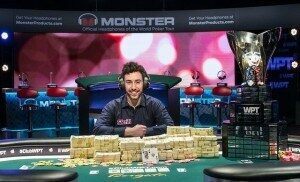 Aaron Mermelstein won the World Poker Tour (WPT) Borgata Winter Poker Open to claim his first major tournament victory. 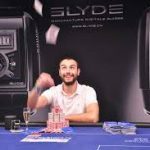 In what was described as a wild final table, where nearly every player held the lead at some point, the 27-year-old from Philadelphia bested his opponents for the win. The final table took a little more than nine hours, saw 17 lead changes with four different chip leaders (out of the six final tablists), and in the end, Mermelstein will take home $712,305. Heading into the final table, all six of the finalists held at least 20 big blinds, meaning each had a viable shot at claiming the title. Shawn Cunix didn’t just come in with the biggest stack, but was attempting to become the 21st player to win multiple World Poker Tour titles. Early on, during hand #14 of the final table, Justin Liberto, who was the second shortest stack, ended up hitting the rail when he four-bet shoved K-Q suited and was called by A-K offsuit by Aaron Mermelstein. Liberto never got the cards he needed and was eliminated in sixth place for $140,878. The next elimination would come after some wild swings between Cunix and Mermelstein. On hand #37, Ester Taylor-Brady would shove the big blind with 9-8 suited and be called by K-Q suited (both hands diamonds) owned by Shawn Cunix. Taylor-Brady felt a rush when she paired an eight on the flop, but Cunix paired his king on the turn to win the hand and eliminating Taylor-Brady in fifth place for $174,118. From there, a four hour grind that saw many lead changes would take place at the final table. Eventually, the odds-on-favorite to start the day to win the tournament would be on the wrong end of a tough hand. On hand #92, with the board showing J-J-T-A (two clubs), Cunix three-bet shoved and Eugene Todd called. Cunix showed Q-J for trips with a gutshot draw, but Todd shockingly turned over K-Q for the made straight. Needing to made quads or a boat on the river, Cunix saw a meaningless 9 hit, and dropped him down to just four big blinds. Fortunately, Cunix would triple up just two hands later and then double up three hands after that. Cunix then found himself back in the tournament with 20 big blinds. On hand #120, Cunix and Todd were all in once more, with Cunix holding A-Q against Todd’s A-J. Unfortunately for Cunix, a jack spiked on the flop and turned out to make Todd’s hand best in the end, eliminating Cunix in fourth place. On hand #153, Randy Pfeifer three-bet shoved for 17 big blinds with Q-T offsuit, and ran into a brick wall in the form of Mermelstein’s pocket cowboys. The kings held up and eliminated Pfeifer in third place for $253,263. Mermelstein began heads-up play with a 3-to-1 chip advantage. It didn’t last, however, as Todd battled and narrowed the difference to becoming nearly even. It was only two hands later though that Todd would eventually meet his fate. On hand #181 of final table play and a flop of Q-J-7 (two clubs), Mermelstein bet, and Todd shoved over-the-top for all his chips. In response, Mermelstein snap-called. Todd showed Q-8 for a pair of queens, while Mermelstein turned over A-Q for the same pair but a better kicker. 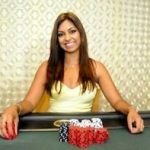 The hand held up and Mermelstein won the pot, the tournament, the title, a seat to the WPT World Championship (worth $15,400) and a first-place prize of $712,305.